King worked to establish closer ties with the United States and acted as something of an intermediary between Churchill and Roosevelt prior to the attack on Pearl Harbor. 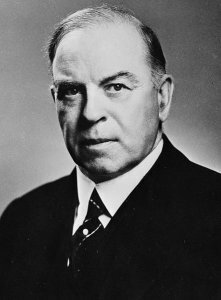 Like Chamberlain, he badly misjudged Hitler, who he believed to be a reasonable man who would eventually lead Germany to a brighter future, but King led Canada into the war on 10 September 1939.King later hosted the QUADRANT and OCTAGON conferences but was not himself a major participant. King's greatest political challenge during the war was over the issue of conscription. Though the Government received approval for conscription in a 1942 referendum, the split between English Canadians (who supported it) and French Canadians (who strongly opposed it) disturbed King, and he did not actually authorize deployment of conscripted men overseas until 23 November 1944. By then he had succeeded in reconciling most of the French Canadians to the necessity. King was a decidedly eccentric man, lacking in personal charisma, a lifelong bachelor who was privately deeply interested in spiritualism. However, he had an excellent grasp of politics and economics and was able to build effective coalitions.